Tire Maintenance Most Crucial in Summer Months Says Lyna Manufacturing Inc. Hot summer months can often mean bad news for truckers and large equipment operators. The summer heat has always plagued drivers as tire pressure can mount from the hot pavement and warm air in the tire causing an unexpected blowout. The record breaking temperatures seen in recent weeks across the United States threaten drivers now more than ever. Lyna Manufacturing Inc., maker of Tire Lyna TCC for commercial/industrial vehicle tires, advises commercial drivers to check their gauges and take preventative care to protect your tires. “Many people make the mistake of thinking that monitoring the air loss of a tire is a normal part of doing business. What they really need to be asking is how can they stop the air loss all together,” said Devraj. As August approaches, the hottest summer on record poses increased problems unique to the logistics and transportation industry. Lyna Manufacturing Inc., would like to remind commercial drivers that now is the time for proper tire maintenance thus abiding by the CSA 2010 regulations. The Canadian manufacturer should know. 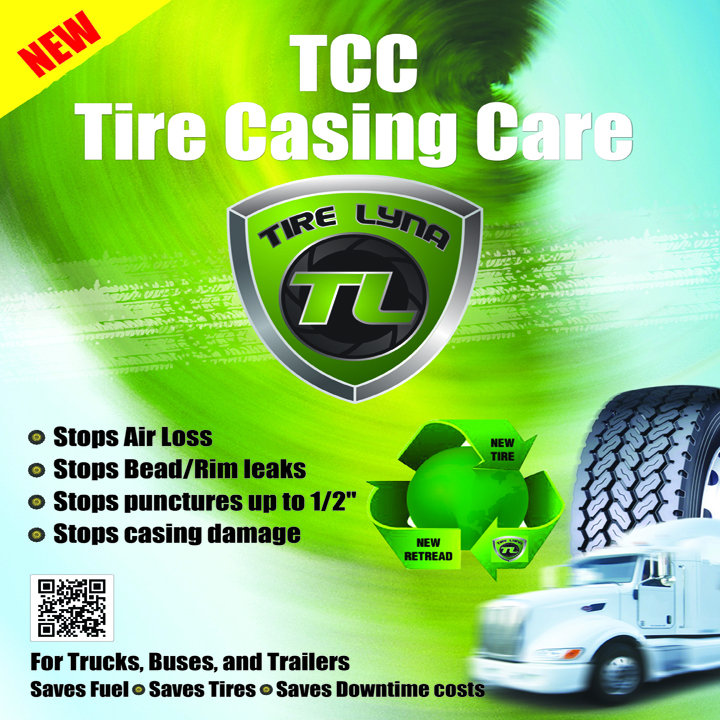 They manufacture Tire Lyna TCC—the only scientifically tested tire casing care product available that properly protects tire casings, stops air leaks, stops punctures and helps drivers avoid dangerous blow outs. Blow outs occur most often during hot summer months as tires get hot and the temperature rises. Tire wear is influenced by factors such as tire pressure, heat, mechanical issues and road conditions. Improper tire wear causes problems that can affect safety and fuel mileage. When the temperature inside the tire increases, the pressure inside the tire also increases. This increase in pressure continues as long as the temperature rises and the tire has not burst or come off the rim. Under-inflation damages sidewalls, and generates heat from road friction that can cause the tread to separate from the tire. With the exception of the tractor's front steer tires; almost all of the tires on a semi-truck are mounted in pairs. When the tire pressure of one tire in a pair is higher than the other, the load distribution between the two is unbalanced, resulting in irregular wear to both tires. Rough, unpaved roads promote irregular or excessive tire wear on even the most perfectly maintained tires. Debris and small stones can cause punctures or tears that create leaks and affect tire pressure. See what the experts say about Tire Lyna—read the independent scientific study here. Lyna Manufacturing manufacturers the world’s best tire safety and tire casing care products, Tire Lyna TCC. Their mission is to produce and market cost-effective, environmentally-friendly tire safety and tire casing care products that help increase the productivity of their customers while decreasing the volume of tires being prematurely discarded into landfills each year. Lyna Manufacturing contributes to the environment by reducing the carbon foot print, by extending casing life so less tires end up in the land fill and by using the best scientifically engineered biodegradable and non-toxic chemicals. Tire Lyna is specifically designed to be used on Commercial tractor/trailers, Buses/Coaches and Industrial/Mining equipment tires. Under-inflation damages sidewalls, and generates heat from road friction that can cause the tread to separate from the tire. Preventing tire pressure loss means preventing sidewall damage and tread separation from under-inflation. 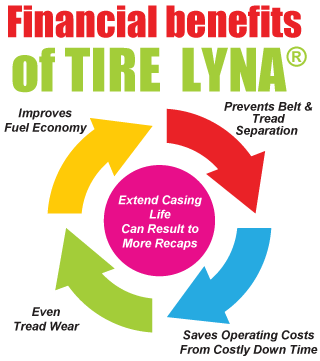 To see what Tire Lyna can do for you, visit http://www.tirelyna.com. Call 877-847-3596 for a test sample. Distributor opportunities available.